This is not the first time that the seemingly iron-clad relationship between the United States and Israel has been strained. In 1956-57, Eisenhower had to get tough to convince Ben Gurion to hand back the Sinai after the Suez War. In 1991, the first President Bush was pushed to breaking point by Shamir’s indecision about taking part in the Madrid Conference, at which the Israelis found themselves sitting around a table with the Palestinians, albeit using an abstruse formula so as not to recognise the PLO and to exclude Arafat. The concept of “security” as perceived by the US and Israel has not always coincided. The US has a string of Arab allies who cannot be upset all at once. Until now, an unspoken rule has limited the obstinacy of the Israeli premiers in order not to actually compromise the protection granted by the US to Israel against its various “enemies”. The novel element of this latest crisis is inherent in the nature of the “threat”, which Netanyahu or his cabinet consider to be the priority in the current circumstances. Is it the Palestinians, Hamas, the Arabs at large or Iran? Or the United States itself? Since the US President’s famous speech in Cairo on 4 June of last year, Obama’s approval rating in Israel has been in free fall with suspicions of him being pro-Islamic either due to his family connections or upbringing. The US military command has clearly stated that Israel’s policies are damaging the strategy of the White House and the Pentagon in the geo-political region which ranges from the Mediterranean to Central Asia. Perhaps Netanyahu has decided to “call” the hand of his most powerful ally not only on the Palestinian question, and not only on the more general pending questions relating to the Middle East but in the entire field of international relations. After all, if the world is in flux, Israel too might attempt to experiment with new options and strategies. The fact that the country has changed so radically since 1956 – and even since immediately after the end of the Cold War – makes such a change even more plausible. With his open challenge on the case of the settlements in Arab Jerusalem, Netanyahu has successfully managed to extend his political support base to unprecedented levels. It makes no sense that greater significance has been accorded to the diplomatic bickering over the settlements than to the settlements per se. The creation of Israeli settlements has been ongoing for years and has irreversibly transformed the territorial, logistical and residential landscape of what remains of Arab Palestine. Almost no importance has been given to the UN’s cry of alarm regarding the inhuman conditions in which Gazans are obliged to live by the Israelis since their so called withdrawal from the strip. The Israeli’s only interest is to fulfil their own prophecy according to which any Palestinian state would be doomed to become a base for terrorist incursions by those who wish for Israel’s destruction. Israel has shown itself not to be a satellite but a country in charge of its own destiny. This is a reality which will come to the fore in a next future when Israel would renew negotiations with the Palestinians, maybe after a few showdowns in loco to keep up the memory of operation “Molten Lead”. In the meantime, the contrast between Fatah and Hamas, the despair of the inhabitants of Gaza and the obvious impotence of Abu Mazen, will have further complicated the adoption of the only official solution on the agenda, two states for two peoples. By then, this solution will have become totally unrealistic as the two peoples will have become three or four and the two states will have been reduced to one, Israel. 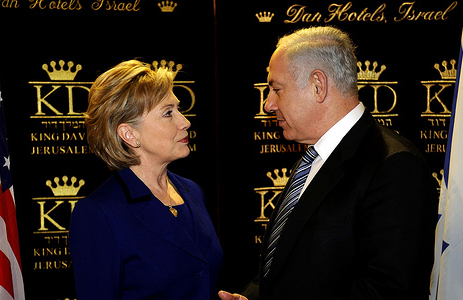 No Clinton, Bill or Hillary, and no Obama will be able to pull Palestine back from the edge of the oblivion into which it will have fallen while the international community stands aside either distracted or complaisant. The issue is becoming more than just a question of defining the borders of a small or miniscule Palestine. Israel can now play the game dictating its own rules. Even now, Israel expresses its own opinion on Iran’s nuclear programme even though it is not participating in negotiations. By slightly keeping his distance from the US, Netanyahu is toying with other scenarios. In recent years the pro pro-West bloc has been losing ground in the Middle East in favour of the network of relations created by Tehran, that now includes Syria, Lebanon and Iraq, as well as Palestine. Turkey’s recent unexpected foreign policy manoeuvres are just the latest example of this. Israel does not disguise the fact that it may at any time opt to use force, even nuclear weapons if necessary. In this scenario, Israel has not only the US as an interlocutor but also Russia and China. Obama might well have been correct when he considered Egypt to be a vital player. Unfortunately, Mubarak is not the right leader to act as a bulwark against a phoney peace which would eventually cancel Palestine and the Palestinians off the map. Nor would he be able to prevent the outbreak of a more disastrous war than any of those fought thus far.